It’s not hard to translate a brick-and-mortar building into pure data. Today’s monitoring and software tools can measure energy usage and efficiency electron-by-electron, track circulation patterns, and anticipate how weather changes will affect indoor climate. It’s a software revolution that’s led to a hardware revolution: dynamic building systems that can react to these reams of data. 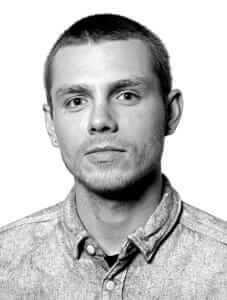 But research scientist Skylar Tibbits of the MIT Self-Assembly Lab thinks that’s not enough. “We’re going beyond the software and hardware revolution to the materials revolution,” he says. With the Self-Assembly Lab, Tibbits is investigating how new or repurposed materials can be used in unforeseen ways that stretch the versatility and strength of building components. He’s also developing materials that program reactive, dynamic properties within their own geometry: joints that bend on their own, furniture that snaps together unbidden, and fabrics that twist and turn into new shapes. There are system components that collapse everything you might need to get a screen to open up when the sun ducks behind a cloud: a light sensor, computer software to make the decision, and mechanical actuators to move the screens. Tibbits’ raw-material ingenuity was on display during the Chicago Architecture Biennial, which closed in January. 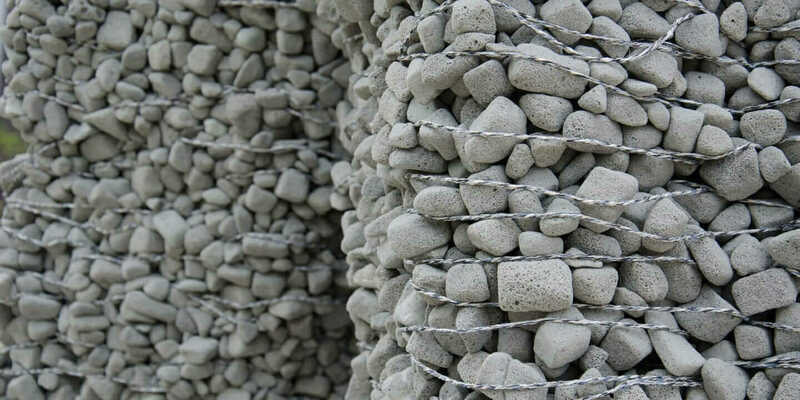 His collaboration with Gramazio Kohler Research (GKR) for their Rock Print exhibit was a 13-foot-tall sculptural monolith on three legs—a pile of pumice-like gray stones miraculously held together by string. It stood out for being one of the few exhibits that focused on new material applications and architectural fabrication. 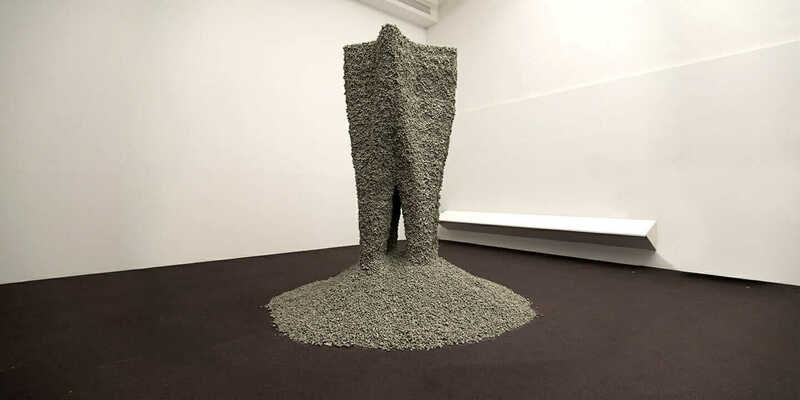 The sculpture is made of Misapor—a foam gravel that’s a glass fabrication by-product. Its rough, lava-rock-like texture and light weight create a rich, tactile experience. At the biennial, the video documenting Rock Print’s construction didn’t dispel much of the mystery: How does this loose collection of featherweight rocks and wisps of string hold this behemoth together? A robotic arm guided by computer algorithms lays out loops of fabric string, and then buckets of Misapor are dumped out on top of it. Temporary barriers wall in the rocks as more string and Misapor is plopped down. Eventually, the walls are removed, and installers poke at the sculpture until all that’s left standing is what’s squeezed into the string frame. It’s a magical violation of how we perceive physics to work in the most basic sense. As Tibbits explains, there are two physics principles binding Rock Print: one a fundamental element of all architecture, and the other less understood. “Jamming” occurs when liquids (or smaller granular solids, like rocks) are forced together in a dense container and begin to behave more like a larger solid. “You see this in the grocery store when you get coffee and it’s vacuum-packed,” he says. “It feels like a brick.” But jamming alone requires a membrane and a vacuum to turn liquids into solids, which Tibbits wanted to avoid. So he and a team at GKR turned to one of architecture’s most ancient physics riddles: the balance between tension and compression. The compressed rocks lock together rigidly as their rough edges come into friction; as the weight on top increases, the monolith grows. The string defines the sculpture’s outer edges, containing the tension and the tendency for the rocks to bulge outward as more weight is added. The combination is plenty sturdy. Tibbits says he’s even found ways to get these materials to cantilever, and a half-size test prototype withstood 1.5 tons of weight, according to Jan Willmann of GKR. Practical uses within architecture for this rock-and-string system abound. Tibbits sees it as “revisable concrete”—a strong building material that “cures” instantly, requires no formwork or molding, and is totally recyclable. There’s also reason to believe it’s much more ecofriendly than traditional concrete. For example, knocking over and harvesting some rocks and string would take far less energy than powering concrete-devouring robots that tear their quarry apart with ultrahigh-pressure water jets. The elegant balance of material properties seen in Rock Print is actually less complicated than the Self-Assembly Lab’s “4D Printing” initiatives. For Eisenstein as well as Tibbits, time is the fourth dimension, and much of the Self-Assembly Lab’s work focuses on printing materials that move and change over time in response to outside stimuli. The outside stimulus could be the addition of heat, moisture, sound, or even random kinetic energy. Examples include furniture that snaps itself into place with magnetic fasteners as it’s rotated in a large ovoid chamber, or printed one-dimensional strips of material with joints that expand and contract into a 3D cube or 2D text spelling out “MIT” when exposed to water. In each case, there are dynamic, reactive systems performing robot-like tasks with nary an external power source. Tibbits is trained as an architect and came to self-assembly after many long nights of backache-inducing manual fabrication for architecture installations, but his lab is wildly multidisciplinary. He’s investigating shoes and shirts that sculpt to your body, and it’s not hard to imagine medical applications for self-assembly as well—like a self-installing coronary stent. This inclusive approach underscores the most profound implications of the lab’s research: the idea that dynamic reactiveness, interactivity, and motion can be built into anything, in any design discipline. Tibbits says he’s not a fan of slavishly mimicking biological systems in architecture or design, but he has noticed that in nature, dynamic interactivity is the rule, not the exception. A world where Tibbits’ ideas have been thoroughly embraced by architecture is a place where wall-scaled shelving components tumbling around in a cement mixer can use nothing more than random kinetic energy to snap together—a scaled-up version of his Self-Assembly Line project. It’s a place where buildings automatically shift toward the sun to gather up enough radiant energy to keep their interiors at an even 68 degrees, and where just applying water or heat to structural elements snaps them into custom-made bowstring trusses.